There are a number of differences in regards to GST handling that you need to be aware of when moving from one accounting package to another. These can impact you regardless of whether you are converting over yourself or using our conversion service. They mainly apply to Tax Exclusive invoices and when the entity is set up for CASH Accounting. This post provides an explanation of the GST differences between MYOB and Xero and how they may impact conversions with transactional history. MYOB / Reckon applies credit notes on any date the user chooses. The result of this, if CASH Accounting is used, is that the applied date is the date that GST is recorded as being credited. For example – Sales Invoice created in February, Credit note issued in March and applied in April. The result is that the GST credit is not recognised until the following GST period. Xero works off the later of the dates of the invoice and credit note. For example – Sales invoice created in February, Credit note issued in March, therefore payment(credit) is applied in March also. The result is that the GST credit is recognised in March, the current GST period. Possible impact is that as the conversion replicates the Xero method of applying the Credit note, the conversion balances can sometimes be affected by credit notes due to timing differences. In our conversions we enter compensating transactions to match the balances in MYOB / Reckon. If an invoice is overpaid in MYOB / Reckon (CASH) then the full value of GST of the payment is posted to GST Collected and then recognised on the BAS. When a refund is made to the customer then the appropriate portion of GST is also posted as a credit. For example – invoice for $110 (inc GST) has a payment of $220 applied (double payment). $20 GST will go to GST Collected. When a refund is done for $110 then $10 will come out of GST collected. If an invoice is overpaid in Xero (CASH) then only the GST portion of the original Invoice is posted to GST Collected on payment, the rest of the transaction is marked as BAS Excluded. This recognises that there has not been a sale just an over payment. 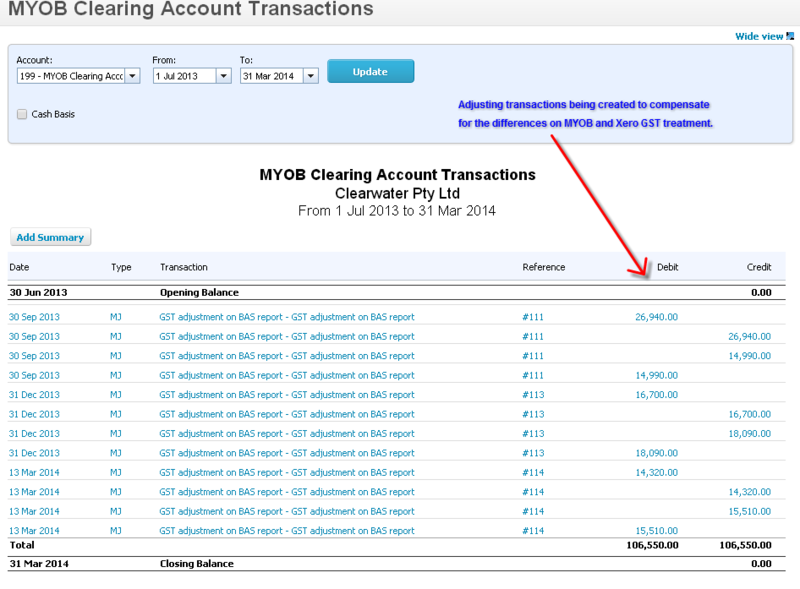 Possible impact is that there will be 2 lines for the transaction in Xero not 1 as previously in MYOB / Reckon. Otherwise the invoice totals will be the same. Some of the system differences as mentioned affect the timing and capture of GST. Due to these differences in our conversions we may need to add adjusting entries to move GST from Paid to Collected and vice-versa to match the quarterly BAS’s submitted since the conversion date (when the transactions commence in Xero). MYOB / Reckon Sales – all GST on the invoice is recognised as GST Collected. MYOB / Reckon Purchases – all GST on the invoice is recognised as GST Paid. For example in MYOB / Reckon – A sales invoice with sale of items plus $25 for freight posting to an expense account for Freight Recovered. All GST will post to GST Collected. Xero Sales – GST is recognised based on the account type used on the invoice, Income to GST Collected, Expense to GST Paid. Xero Purchases – GST is recognised based on the account type used on the invoice, Expense to GST Paid and Income to GST Collected. Due to these differences the totals of GST Collected and GST Paid may appear to be different that your source file. If this is the case, you will find the difference between the two account balances out, therefore the amount of GST Payable / Refundable is captured correctly in the BAS reports. For a basic example: In MYOB if GST Collected is $200 and GST Paid is $50 the total payable is $150. 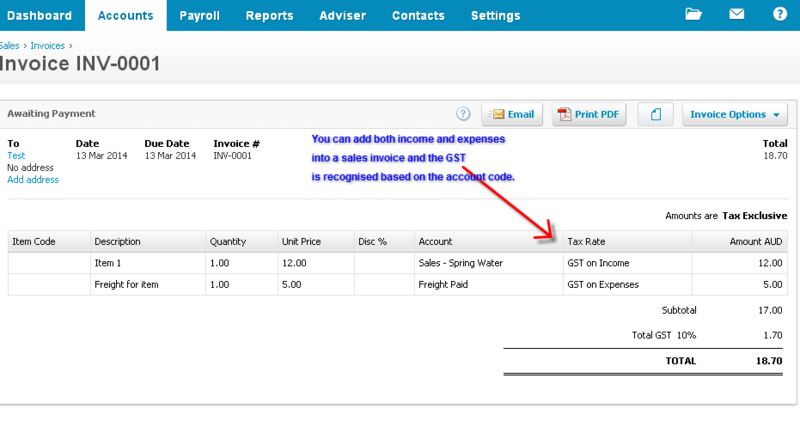 In Xero if GST Collected appears as $500 and GST Paid appears as $350 the total payable remains $150. Unit cost is stored with 4 decimal places. Unit cost is stored with 2 decimal places. Possible impact is that line totals not being the same on conversion, that is that the GST is a couple of cents more or less, but the total of the invoice should be the same. In our conversions we add balancing lines to the transaction so that the Xero invoices match MYOB / Reckon. GST is calculated by using the 1/11th rule based on total invoice amount. 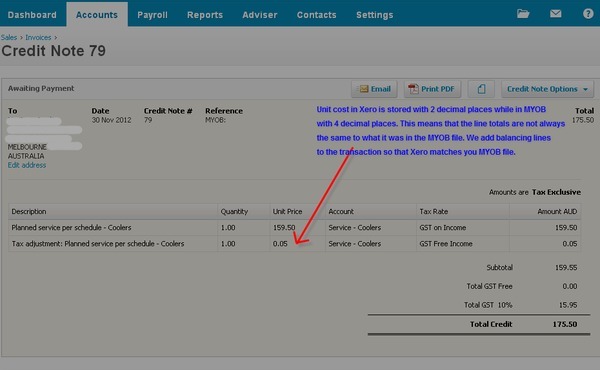 Xero / Reckon calculates 1/11th of the line total. Possible impact for MYOB conversions is that invoice totals could no longer match on conversion. In our conversions we add balancing lines to the transaction so that the Xero invoices match MYOB. Allows editing of the GST amount on purchase invoices to be able to match the provided document. Xero / Reckon is strict on only accepting 10% as the GST amount. (% as set up in the Tax tables for the code used). If necessary for the conversion we will split the invoice lines into GST and FRE lines so that the invoices will have correct GST and Invoice Total. Allows non standard tax codes to be set up. As it is not possible to determine the correct treatment (due to a MYOB / Reckon limitation) during our conversion process it is only possible to establish whether it is GST 10% or GST Free 0%. We cannot complete conversions that use custom tax codes with any other percentages at this point. Possible impact is this may cause variation in the Xero GST reporting. The categories and breakups will no longer exist for historical reporting. As the accountant you will need to add back these non-standard tax codes post conversion. There may be an impact on them flowing through to BAS – here is a link to Xero support on setting up non standard tax codes. Allows more than one GST posting account, usually GST Collected and GST Paid. Ues one GST posting account and keeps track of GST Collected and GST Paid in a sub ledger. In Reckon this is generally called tax payable. Our conversions merge the GST accounts into one account. We also use a GST Conversion Balance account for achieving this goal, this account should not be adjusted or used post conversion. To compensate for the differences in GST treatment between MYOB, Reckon and Xero, we enter adjusting transactions and lines using our conversion Clearing Accounts during the conversion process. Please note: Transactions should not be added to or removed from these accounts without first checking with us as this may have impact on Conversion Balances. As you can see GST treatments differences between MYOB, Reckon and Xero can cause data disruption and potential confusion on the part of your client. At Jet Convert we have developed a methodology for checking and treating GST tax components when bringing transactions across from MYOB and Reckon to Xero. As you are aware compensate for the GST differences between MYOB, Reckon and Xero, we enter adjusting transactions and lines using our conversion Clearing Accounts during the conversion process. If you do a conversion with us transactions should not be added to or removed from these accounts without first checking as this may have impact on Conversion Balances. Our aim is to have the GST data in the best shape possible for your client to work with.